This year’s U.S. Mint last chance sale ends on Tuesday, Dec. 31, at Noon ET. At that time, the Mint will pull all the 2013 commemorative coins, the 2012 America the Beautiful Quarters Silver Proof Set, the 2012-W Proof American Platinum Eagle and the seven remaining 2012 First Spouse Gold Coins. This year’s last chance sale was announced exactly three weeks ago. Since then, sales totals across the products have increased, one of the commemorative coins has sold out with the second lowest mintage, and platinum and gold coins have gone down in price by an amount equal to $50 for every ounce of gold or platinum they contain. 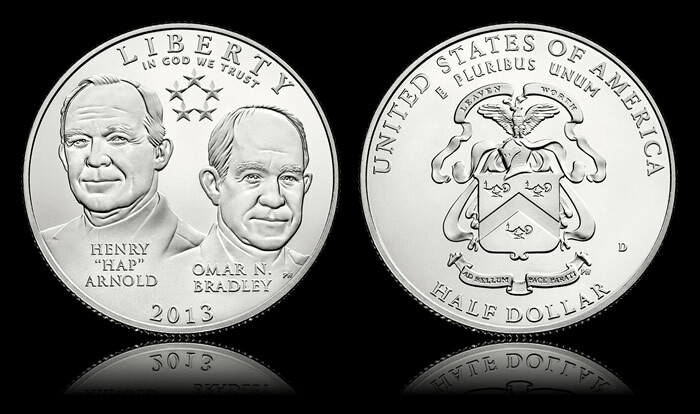 In other developments, it looks like the 2013-D Uncirculated 5-Star Generals Half Dollar may set a new mintage low. Sold individually and within the 5-Star Generals Profiles Collection, its latest sales total is 35,813. 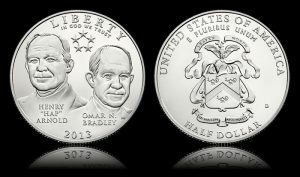 The lowest mintage for a modern commemorative half-dollar is the 2011-D Uncirculated Army Half Dollar at 39,461. Of particular interest from a limited design standpoint, sales for the 2012-W Proof Platinum American Eagle are at 10,007. As one of the six annually changing Preamble designs, its sales level is in the middle of the pack. Below is a breakdown of the last chance products, their current prices and their latest sales totals as of Sunday, Dec. 22, 2013. Also included is a ‘Sales Increase’ column. It shows how much sales have advanced since the Mint announced its last chance sale on Dec. 6, 2013. The above products are found directly from this US Mint online page. Thanks for the tip!! SOLD OUT! Thought I got my order in on time for 30 units. The mint just cancelled. Thanks for the tip as usual! My fault I didn’t act quicker. You guys are a great source of information. Thanks so much and Happy New Year! My 5-Star Generals Commemorative $5 Gold Proof order was cancelled today by the mint, Management Discretion. Placed order on the 29th and since everything is done by computer my order should have been valid. Disappointed that the mint didn’t honor this sale.